To increase the flexibility of FlowSyn up to 2 additional external pumps can be added to allow for reactions that require up to 4 separate inputs! FlowSyn has two pumping channels as standard. When more than two reagents are used, non-reactive starting materials can be pre-mixed, but in experiments where this is not possible or desirable, additional pump(s) may be required. 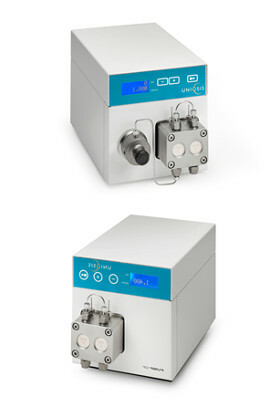 FlowSyn can control up to 2 external HPLC pumps for addition of reagents either at the mixing point or further down stream. Adding the pump couldn’t be easier. Simply plumb it in-line: either at the mixer, or further down-stream for a quench/2 stage reaction. Once plumbed in, the pump is automatically recognised and can be controlled by the FlowSyn when operated through the Manual Control screen. UQ1060 - (upper image) 10 ml/min max, no pressure transducer (also available with a 50 ml/min head - UQ1061). UQ1062 - (lower image) 10 ml/min max, with pressure transducer (also available with 50 ml/min head - UQ1063).